Darwin Community Arts presents 'Women's Wisdom'. 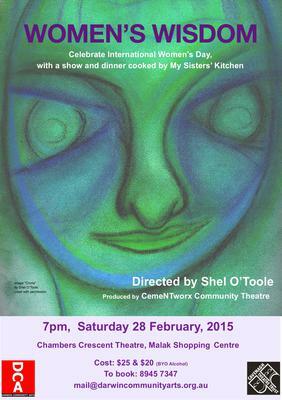 Celebrate International Women’s Day 2015 with the theatre show 'Women's Wisdom' and a dinner cooked by My Sisters’ Kitchen. 'Women's Wisdom' celebrates senior women and is based on their stories about the challenges of living in a youth focused society. This is a community project which not only highlights issues impacting on older women, but also pays homage to their artistic and creative talents.